The developers behind numerous third-party keyboards for Android rejoiced at Apple’s announcement that iOS 8 would allow them to expand their reaches to the iPhone, iPad and iPod touch communities, and now, TouchPal has thrown its hat into the ring with a demonstration of its gesture-heavy offering for the fruit company’s imminent software update. 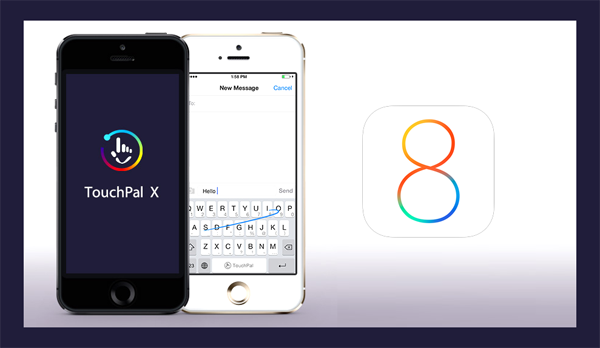 The likes of Fleksy, Swype and SwiftKey have already indicated interest in porting their respective keyboards over to iOS 8 now that Apple has opened the door, and TouchPal – another major player in this sector of the app development world – will also be competing for the affections of iOS users later on this year. Even though each of the keyboards currently available on the Google Play Store offer something different, the vast majority of them are considerably more advanced than anything you’re likely to find through stock Android, and in spite of the fact that Apple has pieced together its own SwiftKey incarnate for iOS 8, it seems very likely that the established third parties will trump the native offering once more. Just today, SwiftKey rolled out its famed Keyboard app for free on Android, opting to recoup revenue by means of add-ons like the new interchangeable themes. Whether this is a sign of things to come on iOS 8 remains to be seen, but with so many companies battling for a share of what will undoubtedly be a very lucrative market, retail strategy will be just as important as their respective credentials as keyboards. Having used TouchPal, Fleksy, SwiftKey and Swype to varying degrees on Android, I’m just hoping that the experience on iOS 8 remains both smooth and functional, and that none of these apps let themselves down when they do finally debut on the App Store. iOS 8, which was announced last week and subsequently launched in beta, is not expected to arrive until September, at which point it will probably be accompanied by at least one new iPhone. We’ll keep you updated on any more news related to third-party keyboard offerings, and will be giving each one a thorough hands-on review once they do finally release to the App Store, so stay tuned to our coverage here at Redmond Pie! In the meantime, check out the TouchPal X keyboard demo video below for a flavor of what’s to come.